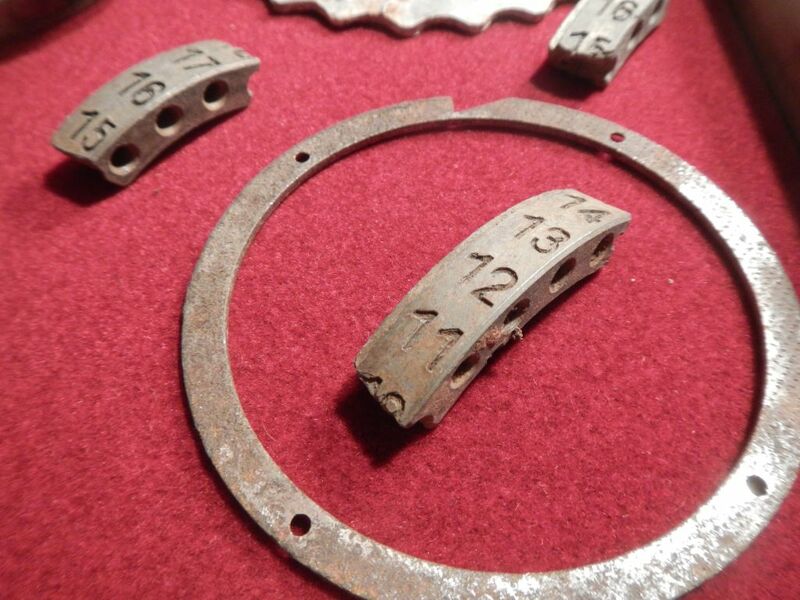 This is a collection of relic and unearthed battlefield-found parts from Enigma machines discovered decades after WWII. 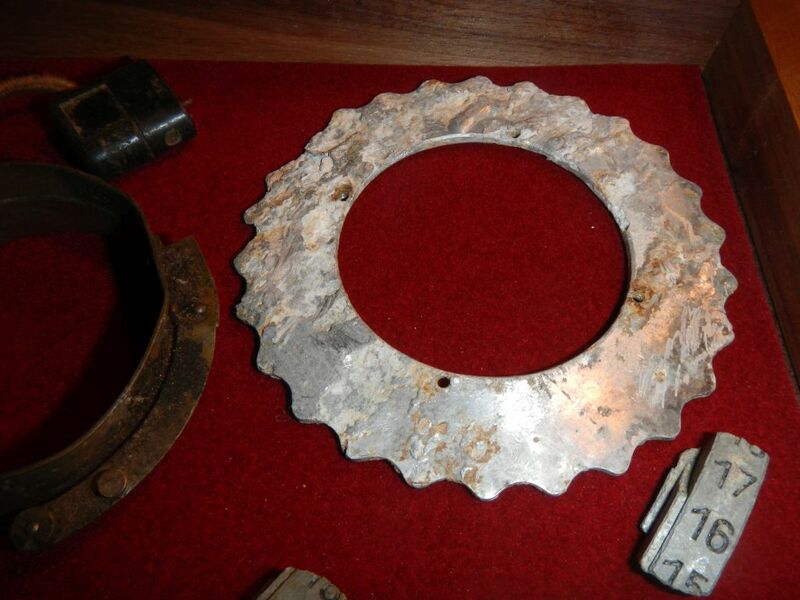 1) Rotor parts – There are 6 fragments from an Enigma rotor. The thumb wheel. 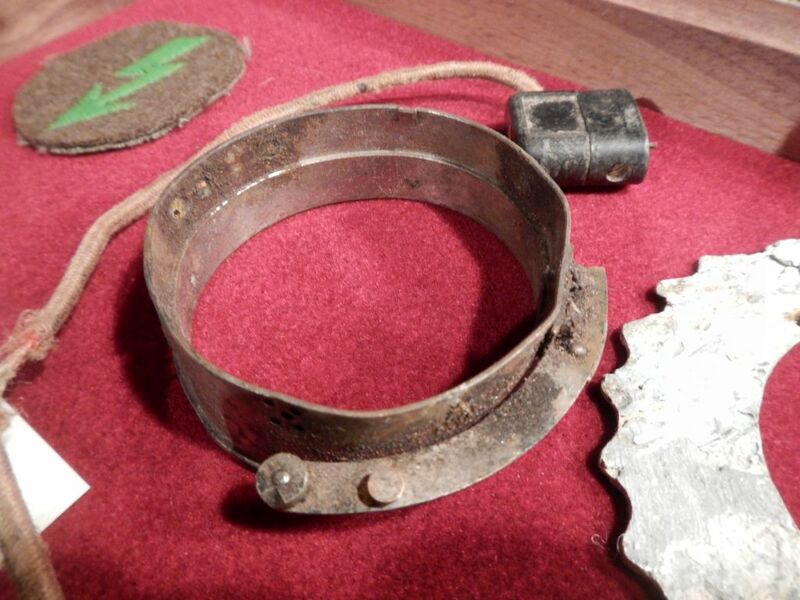 Three fragments from a number ring. The stepping ring from the output side of a rotor. And, the inner rotor shell with the indexing arm attached. The indexing arm allowed the number ring to be rotated to one of 26 positions as part of the Enigma machine’s daily setting. 2) Stecker Cable with Plugs – On the front of the Enigma I (a.k.a. Heeres Enigma) is a plug board (Steckerboard). Enigma machines were supplied with Stecker cables to further the encryption security of the Enigma. This Stecker cable has both plugs and shows signs of significant wartime use. 3) German signal corps insignia – This is the patch that was warn on the uniforms of radio and Enigma machine operators. This is a replica patch. 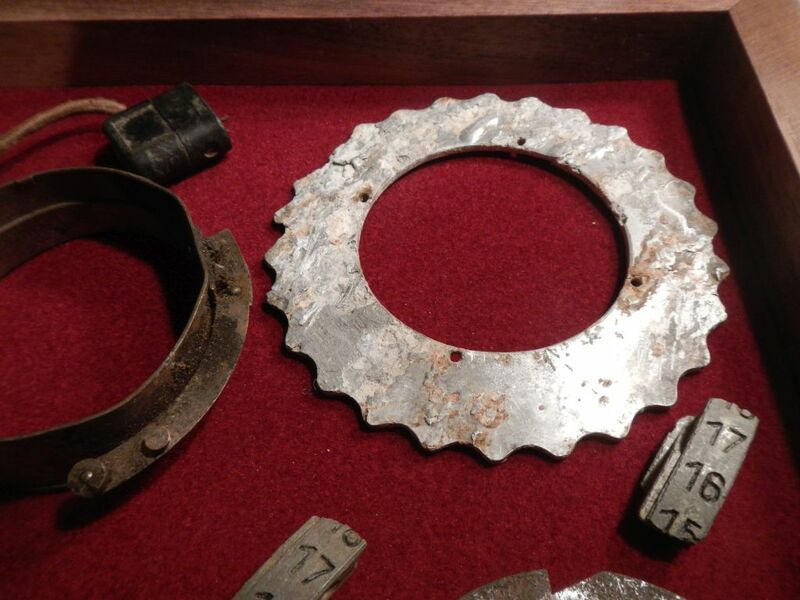 This collection of relic Enigma parts was unearthed from battlefields in Europe. 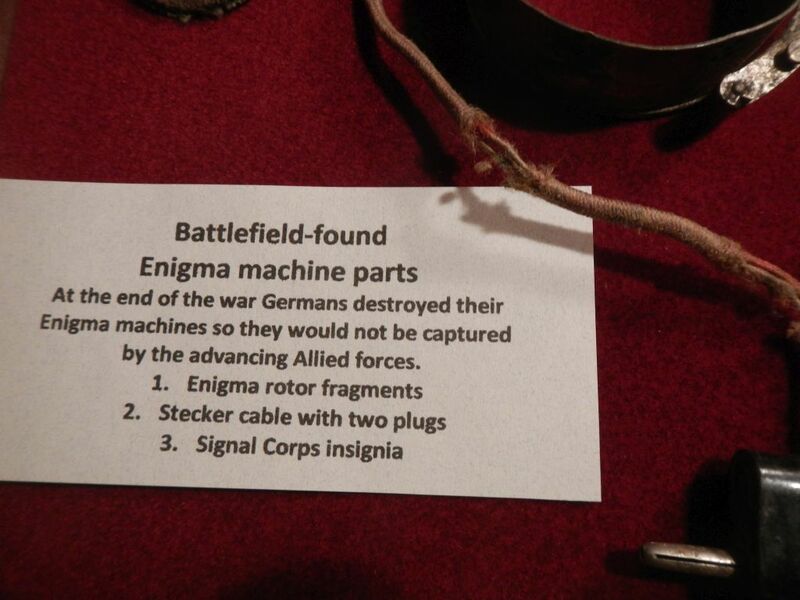 German soldiers had orders to destroy Enigma machines rather than have them captured by advancing Allied forces. All pieces in this collection show signs of significant use and/or exposure to the elements. 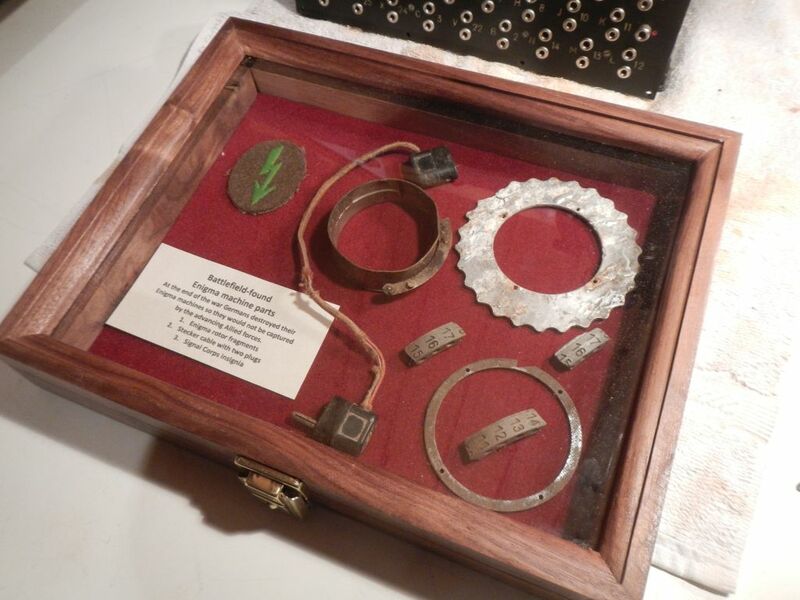 The hardwood, lockable glass display case is included, along with a letter of authenticity from Enigma Museum certifying that these pieces are from Enigma machines. 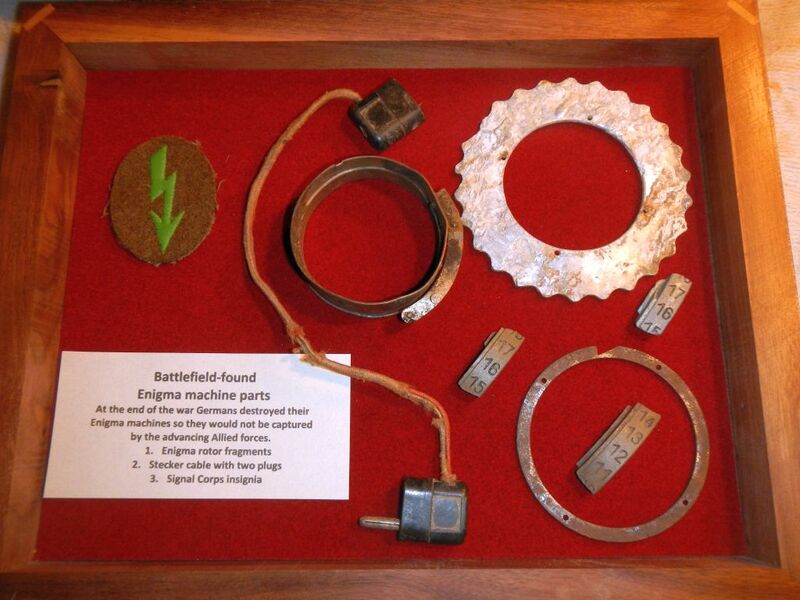 The relic Enigma parts are not secured to the display case so that they can be handled and inspected. The pieces can be placed anywhere desired in the display case. To mount the display case on a wall, one would have to secure the relic pieces to the display case base. The outside dimensions of the display case are 9 1/2″ x 12″ x 2″. A key for the lock on the display case is included. We accept PayPal or personal check. Price does not include shipping or PayPal charges.